A really interesting and creative diversion from the usual film biopic. All of the previous films portraying the life of Steve Jobs have been simply biographical. Replays of chronologic events, interpreted by actors interpreting what they think Jobs might have acted as he plodded through his life. Most of these previous films (starring Noah Wile and Ashton Kutcher) bombed at the box office because a chronological history of anyone loses interest in direct proportion to the length of the chronology. This film chooses three different seminal episodes in Job’s life, exploring the 40 minutes in real time before each. The public launch of the original Macintosh in 1984, the follow-up neXT computer in 1990 and the colorful first iMac in 1998. The screenplay writer Aaron Sorkin (The West Wing) and Director Danny Boyle (Slumdog Millionaire) make no bones about the fact that this film is neither a biopic or a documentary. It is a fictional substrate for the principle actor Michael Fassbender to deliver a performance said by many now to have the Oscar wrapped up for this year. Job’s wife is said to have tried to block release of the film and all of the principle persons portrayed say the portrayals are not “accurate”. The film does not delve into whether the events portrayed are “accurate” or “Truthful”. In “Absence of Malice (1981), Paul Newman suggests to Sally Field that some facts may be “accurate” but not necessarily “truthful” because the truth depends on an observer’s interpretation and as per Heisenberg, observations change the behavior of variables. The “truth” is then a very sticky business to interpret, the writer and director wisely choose not to address. Sorkin suggests he was “trying to do a painting, not a photograph. The film is (sort of) based on facts but Fassbender is given free reign to interpret those facts as he desires, and he pulls it off absolutely magnificently, even hampered by the fact that he does not look anything like Jobs. 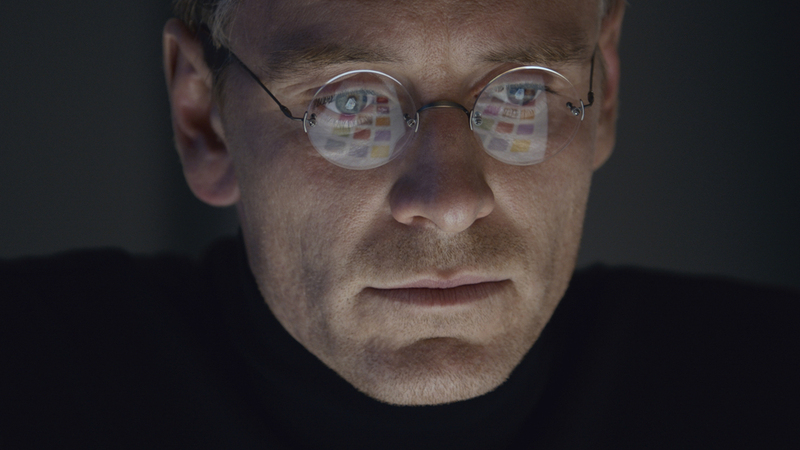 Steve Jobs passionately wanted to change the world and Fassbender passionately taps into that ethos with brilliance. Supporting cast Kate Winslet, Jeff Daniels and usually mediocre Seth Rogan are magnificent. This is in direct contrast to a remarkably different aspect of changing the world, Johnny Depp’s said-to-be accurate portrayal of brutal thug Whitey Bulger in Black Mass (2015). A pointless exercise in “accurately” depicting cruelty and mayhem that goes nowhere except to maximum security. “Steve Jobs” is an absolutely brilliant and outstanding fictional portrayal of a fascinating and complex man who did, in fact, go on and change the world. The portrayal of Jobs and his daughter Lisa’s relationship is psychologically brutal and difficult to watch. In the end Jobs explains his actions: “I’m poorly made”. It is superbly written and performed. I give it five of five black turtlenecks. Highly recommended by me.